Melt butter over medium heat in a large saucepan. Add onion, garlic, and celery, and cook uncovered until onions are soft, about 5 minutes. Add prepared squash, chicken broth, marjaram, bay leaf, and pepper, bring to a boil. 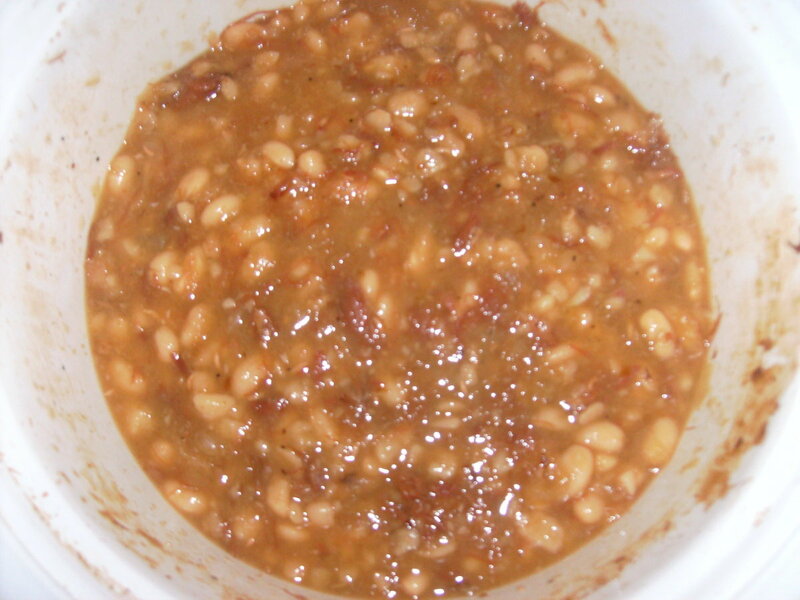 After reaching a boil, reduce heat so that soup bubbles gently, cover and simmer about 20 minutes. Remove from heat, discard bay leaf, and cool for 10 minutes. 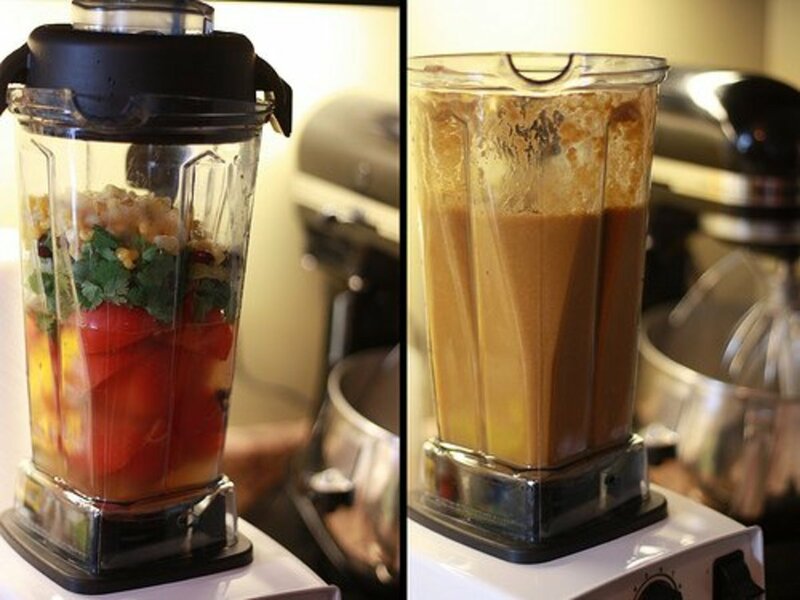 Whirl in 3 or 4 small batches in a blender for 20-30 seconds each for smooth soup. Return soup to the saucepan and stir in buttermilk over low heat for a couple of minutes being careful not to boil. Serve with parsley sprigs. I had a terrible time years ago when I first fixed this soup, having never cooked with butternut squash before. 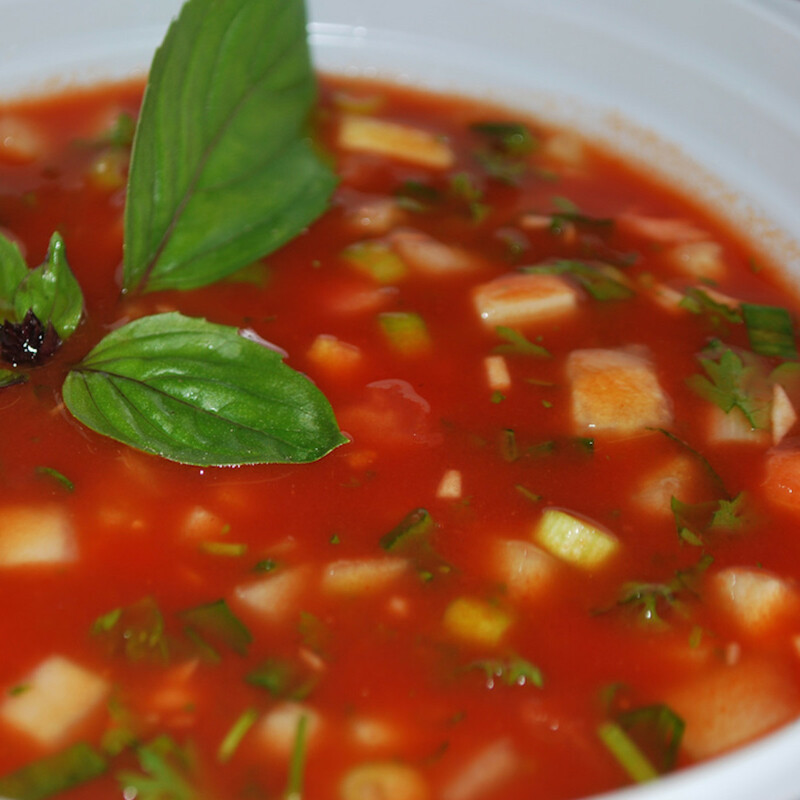 I then found the following method to be the easiest and to result in the most flavorful soup. Preheat the oven to 425 degrees, and cut the squash in half from top to bottom. Scoop the seeds out, which can be roasted like pumpkin seeds and eaten separately. This cutting the butternut squash from one end to the other may in and of itself may be a chore, so be careful.The skin is tough and you will need a good size knife. Oil each piece with about one tablespoon of oil, such as olive oil, all over. Then, bake on a cookie sheet, preferably lined with parchment paper for easier clean up. Bake for about 30 minutes, then allow to cool for about 10 minutes, before cutting into small chunks and adding to the soup. 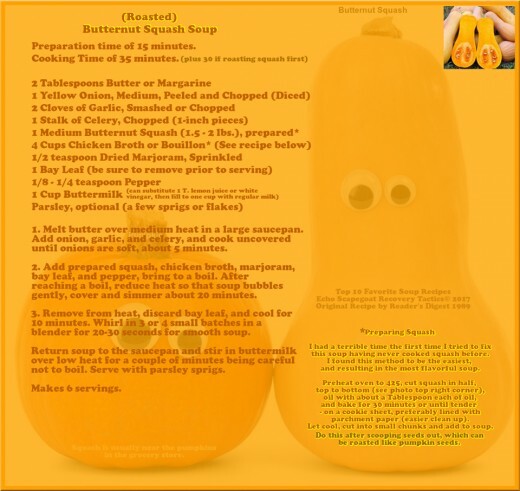 There are several options for adding the 4 cups of chicken broth to the Butternut Squash Soup. Of course, it depends on what your priorities are. For example, you could use 4 little square bouillon cubes with 4 cups of water. Depending on the bouillon you purchased, it could be loaded with preservatives or all natural. Either way, this one is quick and easy. Then, you have the choice of purchasing chicken stock in the can or box in the grocery store. In my area, these are usually at least one dollar each, and you may need 2, 3, 4 for your recipe. This one feels like a better option, but it may add up quickly depending on your budget and how much homemade soup you create. I personally make so much soup in the general course of things that I would need a wagon full. Then, there is my favorite - homemade chicken bone broth. This option can be pretty quick and convenient too with a little bit of planning. That is especially true since you can store the stock in the freezer for up to three months. If you freeze it in convenient to use portions, or even in ice cube trays, that fear of having to spend the whole day in the kitchen in order to choice this option, quickly evacuates. Then, of course, there are instructions in the homemade chicken bone broth recipe for vegetable bouillon in consideration for our vegan friends.